These kind of Sunnis who actively pledged allegiance to the Mullah regime are exactly the kind of “Sunnis” Tehran loves. 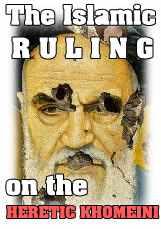 The rest of their lives the will (and have to) chant for Khomeini and his revolution. Among Iranian Sunnis this kind of “Sunni” is also called TWELVER Sunni (Sunniye Isna Ashari). Shiites form a tiny minority of 5% (some sources state even less). There is no doubt that they face oppression from a government that is pushed by strict Sunni clergies. The difference is the honesty, Saudi scholars are at least straight forward and declare Shiism as a deviation and heresy as it was done decades by classical Sunni scholarship. The Iranina Shiite regime on the other hand claims islam and brotherhood, yet suppresses its Sunni minority. Having said that, Saudi Shiites are still in a better position than Iranian Sunnis. Saudi Shias own an entire neighbourhood in the “Wahhabi” stronghold Madinah Al-Munawwarah. An entire Shiite tribe (the Nakhawilah) run a Husseiniyyah (self-flagellation temple), graveyard and centre inside Madinah. In the recent years even public Ashura rituals such as chest beating have been noticed. On the other hand, Iranian Sunnis are never allowed to show any visible presence in Tehran or other Shiite cities of Iran. Kuwait is a majority Sunni country, yet Shiites are represented everywhere, in the captial they run massive Husseiniyyat (Shiite places of worship and self-flagellation). The Kuwaiti parliament represents several Shiites including ministers. Rich businessmen own estates and businesses, something Iranian Sunni businessmen can only dream of in Shiite run Iran. Shiite MPs are so common that Kuwaits parliament even has a number of Shiite clergies as MPs, again something impossible for Iranian Sunni clergies. Shiite places of worship became just recently under target, but then, extremist groups even bombed Sunni Mosques and military, more than once in Saudi Arabia. Shia killings are still common in Pakistan and Afghanistan, but this rather goes back to the aggressive Anti-Sunni nature of Shiism (reviling revered Sunni figures in the most vile form possible is an essential part of Twelver Shiism that is widely practiced by Shiites) and extremists who can’t control their anger and resort to violance. However, whereas Iranian Sunnis can’t run a single bookshop in major Shia cities (like in the capital), yet there are dozen Shia Husseiniyyahs (self-flagellation temples) in Sunni strongholds, including the Pakistani capital and Karachi and many other Sunni cities. As for the political power that Shiites hold, then is it not enough that Pakistan’s founder, Muhammad Ali Jinnah, was an Ismaili by birth and a Twelver Shia by confession, though not a religiously observant man. His coreligionists played an important role in his movement, and over the years many of Pakistan’s leaders were Shias, including one the country’s first governor-generals, three of its first prime ministers, two of its military leaders (Generals Iskandar Mirza and Yahya Khan), and many other of its leading public officials, landowners, industrialists, artists, and intellectuals such as Yasir Wilayati and several other top ranking Pakistani politicians and generals such as Mushaf Ali Mir, Tanveer Naqvi, Yahya Khan, Muhammad Musa and Iskander Mirza. Two later prime ministers, Zulfiqar Ali Bhutto and his Radcliffe-educated, daughter, Benazir Bhutto (her mother was an Iranian and her husband from a big Shia landowning family. He had a zeal for Sufi saints and shrines, especially that of Lal Shahbaz Qalandar, the widely popular Sufi saint of Shia extraction whose tomb is a major shrine in southern Pakistan. ), were also Shia. Not in a million years can Iranian Sunnis dream to hold any such positions, yet strangely many dishonest Shiite propagandists love to compare Iranian Sunnis to Pakistani Shiites, having the audacity of claiming that Sunnis of Iran have more right than Shiites of Pakistan. As for Afghanistan, then one only needs to type Ashura or Muharram and Kabul into google to be exposed to endless pictures of Shiites who are involved in savage Shiite self-flagellation rituals in the Sunni capital of Afghanistan which is Kabul. Every Ashura, streets in Shia areas of Kabul are lined with black flags – as a symbol of the community’s mourning. Such signals of their faith were scarcely in evidence until 2001. After the collapse of the Taliban regime and the freedoms that ensued, they extended their mourning ceremonies to non-Shia neighbourhoods, driving long convoys with flags and loudspeakers blaring religious songs. Where do Iranian Sunnis have such freedoms? Of course Sunnis are not involved in any pagan self-flagellation rituals as Shiites, neither do they ever want to, the point here is that Sunnis are barely allowed to show any presence in majority Shia cities like Tehran, yet Shiites of Kabul publically self-flagellate themselves and perform several other Ashura linked religious rituals. Tehran is the only capital in the entire world (even Greece’s capital and major Zionist cities in occupied Palestine are doing better) that has no Sunni run Mosque. The Shiite authorities prevent Sunnis of having a proper Mosque, run by them, according to their Fiqh (there are just few prayer houses in Tehran and they get ever so often raided and are under heavy pressure by the officials) yet the Shiites of Kabul (Sunni captial of Sunni Afghanistan) built one of the biggest Shia Mosques of the entire country, he Abol-Fazl Mosque in Kabul in 2008 (i.e. just recently!). As for the political power Afghan Shiite hold then Iranian Sunnis can only dream of having 1% of the power of Afghan Shiites. Take for examples the Hazaras (the infamous foul mouthed Shiite cleric Allahyari from Ahle Beit TV is an Afghan Hazara). As Afghanistan’s only substantial Shia population, the Hazara share a strong connection to Iran that stretches back centuries. Ethnically, they represent Afghanistan’s third largest minority, comprising 10-15 percent of a population of 28 million; they are neither Persian, Pashtun, nor Turkic, but are believed to be Mongol in origin (left overs of Jhengis Khan’s army). Their traditional homeland, referred to as the Hazarajat, lies in the Hindu Kush mountains of central Afghanistan. There are also enclaves in West Kabul, as well as in refugee communities in Iran and Pakistan. The Sunni Pashtun president of Afghanitan, Karzai appointed six Hazaras Shiites to his cabinet, Ahmadinejad and the curent Iranian president Rouhani appointed zero Sunnis. An eye-reach shows that Shias enjoy an absolute freedom in these two countries; as vice president, some governors and ministers are Shiite in Afghanistan. The president of Pakistan belongs to Shia community, there are some other important public figures belong to Shia community in Pakistan even in Army and intelligence services. Religiously, Shias enjoy full freedom, as there are many Shiite worship places in Kabul and Islamabad and wherever they live from small to big cities. After all these facts, is there any doubt that Sunni Iranians are treated can only wish to enjoy half of the religious and polticial freedom of Shiites (in Sunni majority countries)? In sha Allah the just will judge with justice in particular in the light of Iran being so mouthy claiming Islamic unity and accusing others of secterianism.